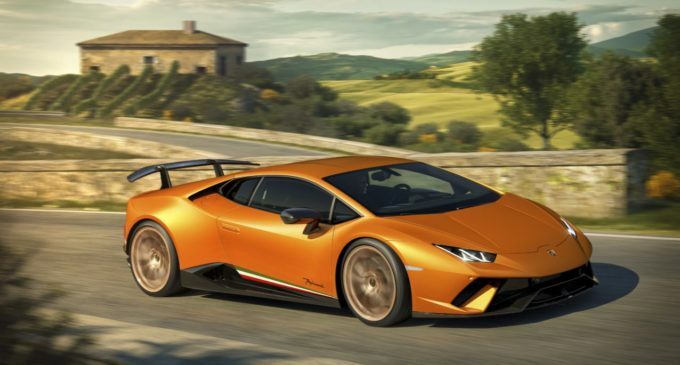 Lamborghini unveiled the Huracan Performante as a tuned up version of their Coupe version. Just about everything was reworked during the development of the Performante, including its weight, engine, chassis and aerodynamics. After all of the changes were said and done, the Huracan Performante would go on to complete the Nurburgring Nordschleife circuit in a record-breaking 6:52:01. On the outside, the Huracan Performante is similar to that of the Coupe, but with the added aerodynamic components. The front and rear spoilers were added for the sake of aerodynamics, but they add a touch of aggressivenmss that the Performante needed. For U.S. buyers, the Lamborghini Huracan Performante price or MSRP is set at $274,390. This price does not include any options. However, this is a decent price, because many expected the car to be much more expensive, and it’s only around $30,000 more than the base model. Inside the Lamborghini Huracan Performante is a cabin that is as driver-oriented as they get. The carbon fiber seats, for starters, not only drop the weight of the car, but also hold the driver in place during high-speed cornering. Alcantara was chosen for the upholstery, which is also extremely light, but also luxurious. All of the Huracan Performante’s mechnical aspects work seamlessly together in order to provide power when needed. Powering the car is a naturally aspirated 5.2-liter V10 engine that’s more powerful than the base Coupe’s. Mated to the engine is a 7-speed Lamborghini Doppia Frizione (LDF) dual-clutch transmission. However, all of this power is worth nothing if the handling isn’t top-notch. For that, the Huracan Performante has double wishbone suspension and Lamborghini Electronic Power Steering. The naturally aspirated 5.2-liter V10 engine installed in Lamborghini Huracan Performante is a piece of modern art. New intake ducts were inspired by Lamborghini’s experience in motorsports and the transmission was made to support the engine’s powerful capabilities. This engine is capable of producing 640 horsepower and 442 lb-ft of torque. The Lamborghini Huracan Performante is equipped with a suspension system that includes a double wishbone architecture. This standard suspension system also works in cooperation with the optional magnetorheological (MR) shock absorbers. When put to the test, the suspension will adapt to any driving style, quickly. The Lamborghini Huracan Performante’s steering system is an Electronic Power Steering (EPS) setup. Thanks to EPS and it’s ability to adapt to any driving style, drivers of this Italian supercar will be able to take to the track or canyon roads without hesitation. There is also the optional Lamborghini Dynamic Steering (LDS) system, which lets driver’s change the steering ratio. The Huracan Performante’s 7-speed Lamborghini Doppia Frizione (LDF) dual-clutch transmission is not only quick, but also as smooth as butter. What this transmission does is while one gear is engages, the next gear is already selected and ready to be shifted to. This reduces the shift time, and allows for an instant and smooth gear shift. The system does this by opening one clutch closing the other. Nothing is more exciting than launching a car with an all-wheel drive system, and thankfully the Huracan Performante is equipped with one. This electronically controlled system gives driver’s instant acceleration, incredible handling around corners and the best corner exits you could imagine.